Losing weight is all about motivation, and a great way to stay motivated is to regularly weigh yourself and take your body measurements. It is very important to take body measurements in addition to weighing yourself because typical bathroom scales only show you how much you weigh; they don’t tell you what your fat to muscle ratio or BMI is. Tracking your progress is a great way to stay motivated because it can help you see how far you’ve come and help you stay on track. However, for some people, keeping track of their weight can be a troublesome task because they don’t have the organization skills to be able to record their weight over a certain period of time. 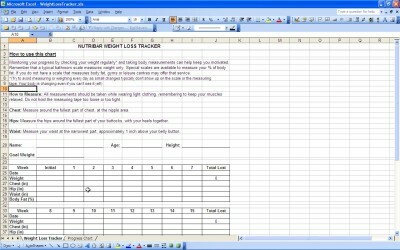 If you are one of those people, you will certainly benefit from using Nutribar Weigh Loss Tracker, a special downloadable excel template that allows users to jot down the fluctuations in their weigh. This template is a great aide in your overall weight loss. The reason why is because it can help users stay organized when tracking their weight loss or gain. This template allows users to enter down vital information each week such as their weight, measurements and muscle to fat ratio. The Nutribar templates are very similar to the charts that medical professionals use to keep track of the height and weight of their patients; therefore, making it a very effective way to stay organized. In addition, this template is totally free to download on computers that use Windows Vista, Windows XP and 7. This template is in the form of a calendar, so you can choose to track your weight on a weekly or daily basis, and it even helps you organize what you have eaten that day.